This failure created a refuge. Resorts are shelters against time — standard time (even if they rely on railroads for visitors). Resorts in the mountains or at the sea, run on “sun time.” Freed from schedules, people can step into the day, into a kind of free-flowing time they remember from childhood, or a sun-drenched boredom. 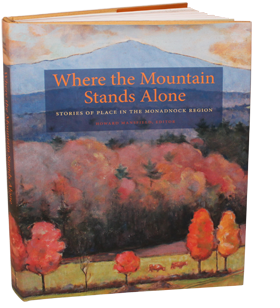 Monadnock — the mountain that stands alone, mountain island, in the Algonquin languages — offered a refuge. The Monadnock towns were rediscovered by waves of summer people, back-to-the-landers, artists, Massachusetts tax refugees, retirees swimming back to their summer camp memories, and believers in the image that New England had created for itself. (The small town, white-steepled home of America’s pious and better angels.) Old timers found themselves facing a legion of “flatlanders” or “new natives,” who were quick to call New Hampshire’s “Quiet Corner” home. Some of these people were dissenters from the drive to make every place look alike; others just wanted that product in a smaller package. In the failure of upright Yankee toil, they found freedom. The farms had failed and left a forested land; the mills had failed and left a bounty of water in the dammed ponds, lakes and brooks. The towns they had built by common consent are much better than our most earnest work. The southwestern corner of New Hampshire was, true to its namesake, a mountain island. This book is a chronicle of that failure and its aftermath in the region where the mountain stands alone. This book takes its outline from the shape of human settlement in Northern New England: First Encounters, Making Land, Emptying Out, Returning, and, Here and Now in the Global Marketplace. With essays, recollections, historical documents, and photos, Where the Mountain Stands Alone portrays life as it was once lived, and as it is lived today. We do not present a straight history, a recitation of dates and facts, but rather the stories that capture the life of a place, the habits and hopes of a community. “Sense of place” is the over-worked phrase. The anthology mixes history, memoir, geology and geography. The elusive feel of one place exists in that intersection of political and family history, landscape, destiny, expectations, weather and time.